My Mom’s chili was always a favorite growing up. When I began cooking for myself, I immediately began branching out in terms of flavor and techniques. My chili has evolved over the past couple of decades, including versions with black beans, white beans, turkey, ground pork, potatoes, pasta, turnips, carrots & rutabagas [not all at once]. I enjoy experimenting in the kitchen, and chili is a very forgiving subject, because every variation I’ve ever tried has turned out pretty darned well, if I do say so myself. This represents my classic chili, including my patented flavor base, and when the temperature dips below 50, I start tripping over the dropped reminders of how long it’s been since we had chili! This is NOT a Cincinnati- or Texas- or competition-style chili. Period. I didn’t grow up with those, and while I appreciate them for their various merits, this is the chili that speaks to me of comfort and home when the leaves start falling or the snow is blowing. Enjoy! In a large dutch oven, brown the beef. Halfway through, add the onion and green pepper. When the beef is just cooked, make a well to reveal the center of the pot. Add the Balsamic vinegar and the tomato paste, stirring to cook for about a minute. Add the garlic, half the chili powder and all the other spices (no salt, though! ), stirring to combine. Cook for one minute to bloom the spices. This is the flavor base for the entire pot. Open the beer. Have a drink and pour the rest in the pot. Cook, stirring occasionally until the liquid reduces by half, about 5 minutes. Add the tomatoes and beans. Bring to a simmer. Open another beer. Cover and put in a 325 degree oven for 1 hour, stirring every 20 minutes. Drink the second beer. At the 1 hour mark, stir in the Jack Daniels and the molasses. Taste and adjust the seasoning, adding more chili powder for more chili flavor and red pepper flakes for more spice. Return to the oven uncovered and cook for another 15 minutes. Taste again, this time for salt and black pepper. NOTE ON SPICY: The optional chili flakes will give a nice medium level of heat. 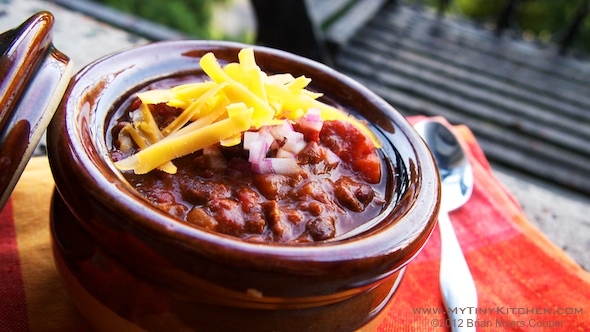 Omit them entirely for a milder chili, and add a little more later in the recipe for more kick. Be careful with salt – most prepared chili powders have quite a bit of salt, so don’t add any salt until you know you have your spice level right, then salt at the end to taste. Start with a half teaspoon of kosher salt, and a 1/4 tsp of freshly ground pepper, stir, wait a couple of minutes and taste. If you need more, add in 3-finger pinche increments of salt, stirring and waiting a couple minutes between tastes. Serve topped with shredded cheddar or Jack cheese, chopped red onion and sour cream, along with toasted garlic bread and another one of those cold beers–I mean, you bought a six-pack so you have five more, right? Sometimes I’ll brown 1 inch chunks of chuck roast instead of using ground beef. I’ll often use ground turkey for half, or even all of the beef. The sweetness in these vegetables complements the spice nicely (and I do like it spicy), plus it’s a cool way to incorporate the oft’ neglected turnip into my otherwise turnip-less life!